Blue Earth County Library, Mankato, on Friday, November 16, 9:30 a.m.–3:30 p.m.
Workshops are limited to 50 participants each. Register for the Mankato area workshop today. Learn more about the workshop or contact Joe Manion (651-582-8640) with questions. A 2017 appropriation allowed the Legislative Reference Library to digitize 29,000 audio tapes. This digitization project and resulting database enhances the existing collection of digital hearings and floor sessions, making these valuable primary records of the Legislature accessible to anyone at any time and preserving them into the future. Researchers are now able to listen to all committee hearings and floor sessions back to 1991. The database draws upon other sources of information such as House and Senate floor logs and committee members for each standing committee. For further information, please contact the Legislative Reference Library (651-296-8338). The 2017-2020 Association for Library Service to Children (ALSC) Summer/Out-of-School-Time Learning Task Force is seeking your feedback about how to share best practices in summer learning. Please fill out the ALSC: Summer Learning Webinar survey by November 21. The Toward Gigabit Libraries Toolkit is a free, open-source technology learning, diagnostic, and advocacy tool designed for public and tribal libraries in the U.S. Funded by an IMLS grant, it is designed to scale nationally to all libraries, regardless of size or geographic location. The toolkit will guide you through a series of questions about your technology environment, and provide you with all the information you need to answer those questions. It can be used to diagnose and fix library technology problems, help you prepare for Erate requests, and even open up lines of communication between library and technology staff. After you’ve completed the toolkit, you can use another document called the Broadband Improvement Plan to create your own long-term and short-term strategies to improve your technology. Learn more from a brief Youtube video and visit the toolkit website to try it out yourself. Registration is now open for the February 2019 cohort of Stand Up for Health: Health and Wellness Services for Your Community. This free online course was developed in cooperation with WebJunction, PLA, and public librarians to create a cohort learning experience and registration is limited to public library staff. Over four weeks, you will explore consumer health, health reference in a public library environment, free health resources for library staff and patrons, and developing health- and wellness- related programming. 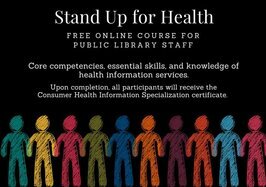 The course provides 12 continuing education (CE) hours from the Medical Library Association (MLA) and covers the five competencies required for a Consumer Health Information Specialization (CHIS) from MLA. The course runs February 4-March 3, 2019. Plan to spend 3-4 hours a week on course work. There are no set hours to be online each week, but it is important that you complete the discussion and assignment for each week in a timely fashion. New content will be released each Monday. Register now for Stand Up for Health. For more information, please contact Bobbi Newman, Community Engagement and Outreach Specialist for the National Network of Libraries of Medicine (NNLM), Greater Midwest Region. To help grow health literacy, the National Network of Libraries of Medicine (NNLM) has launched the NNLM Reading Club. The goal is to support libraries’ health literacy efforts and address local communities’ health information needs by celebrating important National Health Observances through the fun and intimacy of a book club. The NNLM Reading Club offers a selection of three different book titles along with corresponding free, ready-to-use downloadable materials designed to help promote and facilitate a book club discussion on a health issue or topic. Beginning November 1, participating NNLM libraries are making the quarterly Reading Club picks available in a free Book Club Kit. This program-in-a-box format includes eight copies of each of the following items: the selected book, discussion guide, and additional material in support of the health topic--all tucked inside a handy library book bag and shipped to the requesting library. Any U.S. library that is an organizational member of the NNLM is eligible to apply and to receive one kit from November 1, 2018-April 30, 2019. Due to the limited supply of kits, libraries that support outreach to vulnerable populations receive priority status. For more information, please contact Darlene Kaskie, NNLM Community Engagement Coordinator, Greater Midwest Region.